St. Patrick's Day is around the corner, and we are continuing the ☘️themed week today with this simple DIY addition activity. Hands-on concrete learning with visual counters is more accessible to children than the abstract mathematical concepts. So, this DIY is an invitation to count, perform addition, feel the counters, trace the sandpaper numbers and make numbers with pipe cleaners! We are using shamrock cutouts (these glittered ones) and lucky Leprechaun gold coins as counters. TIP: for a DIY, cut out shamrock shapes yourself from green cardstock (two smaller identicals for addends and one larger for a sun), and use any green counters you have handy: pom poms, buttons, beads, marbles etc. You may download the Addition worksheet here. Once the child calculates the sun, offer to make that number from pipe cleaners and also offer to trace it using Montessori Sandpaper numbers. As a variation, offer to practice counting and adding styrofoam balls (we are using recycled tomato cardboard container to hold the balls). I placed each addend into a shallow smaller bowl and the "sum" bowl I chose a little bigger to emphasize that the bigger bowl ~ the sum~ will combine the two smaller ones. (For a detailed lesson on Addition, see links below). Tonging is a wonderful way to practice and strengthen fine motor control. If you would like to ✂️ make sandpaper numbers, see here a video-tutorial 🖐️Sandpaper 🔢 Numbers (Montessori 🔢 Math 101 🎥 Series 🎇 Curriculum), and see here how we made sandpaper letters "DIY Sandpaper Letter "S" (Montessori 🔠 101 Language). Finally, ask your child to determine whether the sum-number is an odd or even number. For a detailed lesson on Odd and Even, see here a post "🍁Fall-Inspired Odd and Even (Numbers & Counters)" which has links to other Odd/Even lessons. Taking it up a 📈notch by adding three addends (instead of two in a regular equation) since a ☘️shamrock has three leaves! 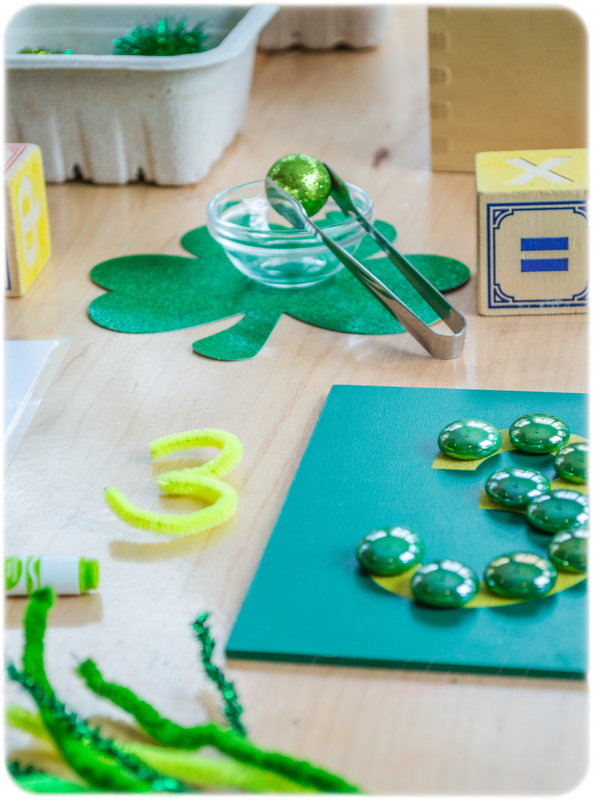 This simple math addition DIY is super easy to set up: all you need is a 🍀paper puncher and pipe cleaners to make numbers to reinforce 🔢number recognition and proper tracing. Buy a similar shamrock here (same size as we are using ~ 1") or buy a smaller 5/8" clover puncher here. See here a 🎥 video of Adrian making Montessori Sensorial Tracing Tray using a polenta filler. For more on St. Patrick's Day inspired math activities, see here ☘️Shamrock ✂️DIY ♻️Recycled 🍡Popsicle Puzzle Skip Counting by 🔟s. Also, see our entire unit study here ☘️St. Patrick's Day Kids Activities. See here a video post "➕Addition Strip Board (Montessori 🔢 Math 🎥 Lesson)." For more on addition, see a post 🎥 here "Montessori Math Simple ➕ Addition using Marble-Counters" which also has an intro What is Montessori Math? Also see here an Extension to Strip Board: "➕Addition Strip Board Making 🔟’s (Montessori 🔢 Math 🎥 Lesson)." For more on math, see here a post 🎥 video "Beginning ➖ Subtraction 🎥 (Montessori 🔢 Math Lesson)." See links to previous math lessons here.